When have you met poetry during your life? Maybe you were in your classroom, at the elementary school, and the teacher forced you to memorize “Il sabato nel villaggio” by Giacomo Leopardi: “La donzelletta vien dalla campagna,/ in sul calar del sole/”. Where was she going? What did she have in her hands? Who knows! You just remember your teacher’s pink and glossy lipstick. Maybe that time in the underground you were sitting next to a really lovely couple, too much lovely, and he gave her a Baci Perugina chocolate; while she was reading the love note with a Shakespeare’s sonnet quote written on it, you turned up the volume of your headphones: poems are such a girly thing! Or that time you were facing a drama: the year before you gave your dentist a pretty silver frame for Christmas but this year you really don’t know what kind of gift you will give him. The solution was huge and in front of your office: a big Mondadori store, on display there was the latest Fabio Volo’s book, a poetry one. We could go on and on with examples like these because we grow up being used to the idea that poetry is something boring or mushy or pretty but essentially useless as a nice silver frame. If this is poetry and its relevance in our lives, we don’t have to be astonished discovering the tragic and chronic crisis afflicting Italian poetry market. This market could be divided into three main segments: big, medium and small publishing houses. Concerning the first one, among the main players are Mondadori, Einaudi, Fazi, Garzanti, Guanda. This kind of publishers prefers well recognized poets, at least over 50 years old but possibly already dead, and uses its consolidated distribution channels. You can have a taste of this situation watching at the top sold poetry books on internet: out of 50 authors less than 5 are still alive! This market counts on an average number of 3000/5000 books sold for each title: a good result but a very little one if compared to the fiction realm. Medium publishers, like Zona Editrice, Transeuropa, d’If, Giuliano Landolfi Editore, on the other hand, offer the most innovative poets but they haven’t the economic strenght and influence to allow them to be present in the bookstores. The last category is composed by those small enterprises that call themselves “publisher” but they actually are vanity press: authors pay to have their books published. Hence, innovative and really “contemporary” poets are almost exclusively published by the second sector, medium publishing houses, but their works are mostly unknown or very difficult to find even by careful readers. Moreover this tumbling market has to face the fact that in Italy there are about 20000 writers who consider themselves poets. What do they read? They don’t read a lot of poetry, for sure! The matter of audience appears very clearly and this issue is absolutely multifaceted: it involves several kinds of responsibilities and guilt. First of all, as we tried to explain before, schools, teachers and education systems in general are core players in developing a mental habit regarding poetry. If education and its tools are obsolete and make poets look like somebody mouldy, avant-garde poetry has no chance, it is condemned to be buried by bestsellers, mainstream and great classic authors. Besides this, among a lot of poets, especially from the 80’s, has emerged a self-inflicted form of isolation from the rest of the world. During the 60’s and 70’s poets as Pier Paolo Pasolini or Eugenio Montale were at the center of the cultural and political scene, they wrote about the society they were totally in and modernity, but after this estrangement process, poets now risk to seem like earrings, decorative but far from necessary or significant. This scenario is luckily changing, there are a lot of poets who want to stay inside the modernity, want to write about it and above all they stare at the eyes of their audience, take their hands, fascinate their ears. Cultural association “Blare Out” – the authors of this paper are part of it – decided to focus its attention on this kind of poets. Our aim was to engage audience, make people think poetry is something that doesn’t have to be read alone, almost drowning in your living room’s blue couch. 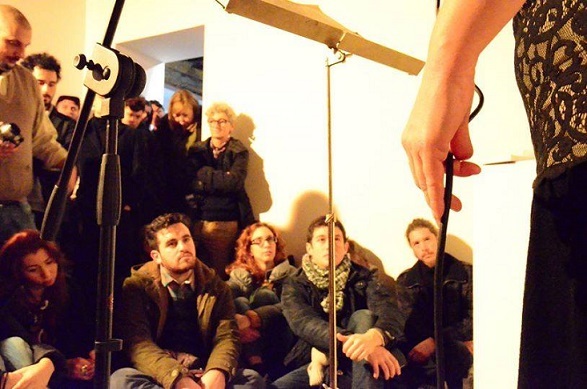 It has to be read loud, collectively, to be performed with voice and body: performance was the leitmotiv of our festival. 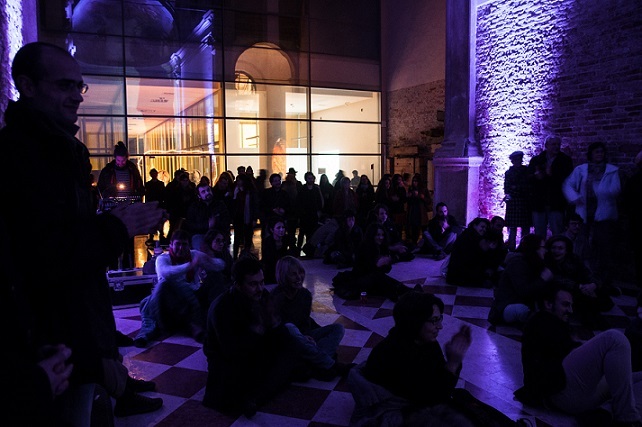 Strongly motivated by the two poets in our team, Alessandro Burbank and Julian Zhara, we gave birth to the first edition of “Andata e Ritorno – Festival di poesia orale e musica digitale in Venice” (28-29-30 November, 2013). We wanted this Festival to be an intersection between different artistic fields: especially performed, oral poetry and electronic music. Why? Simply because poetry is music and we supposed that this specific mix could be the key to offer e new perspective on poetry and contribute to rejuvenate it. “Andata e Ritorno” in fact is not the kind of event where poets read, DJs play and spectators listen well sedated on their seats and watch numbly: It is a place of dialogue, a space where sounds and poem lines can be listened, watched, smelled, read, tasted and written. And, well, maybe we attained our purpose during the first edition, reason why we decided to organize a second edition: “Andata e Ritorno 2.0” (28-29 november 2014 – Venice). This time we were in Herion, Venice creative incubator, and as in the first edition we managed to offer an immersion in several artistic languages and, at the same time, as an emergence from old and traditional enjoyment approaches. We brought to Venice some of the most interesting and innovative poets in the national panorama. During the first edition of “Andata e Ritorno” we hosted Lello Voce, Frank Nemola, Luigi Nacci, ScartyDoc, Alessandro Burbank, Maria Valente, Sebastiano Adernò, Giacomo Sandron, Sergio Garau, Luigi Socci, Federico Scaramuccia, Luigi Nacci, Marco Simonelli, Rosaria Lo Russo. 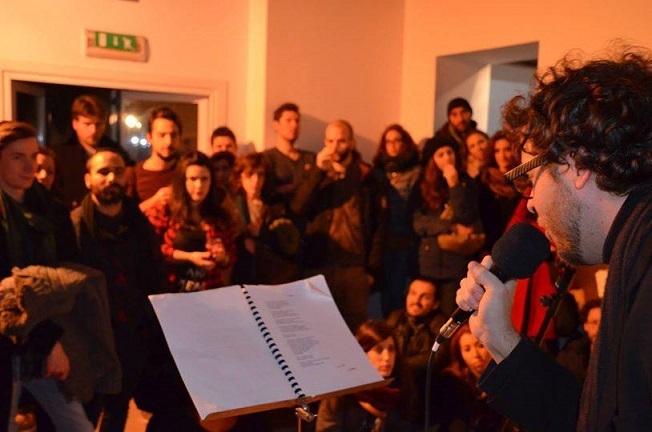 The protagonists which performed in the second edition, “Andata e Ritorno 2.0”, were Antonella Bukovaz, Massimo Croce, Fabio Orecchini, Domenico Brancale, Nicola Di Croce, Alessandra Racca, Paolo Agrati, Dome Bulfaro, Tiziana Cera Rosco, Andrea Serrapiglio, Laura Whilborg. When we started to tell people we were planning a poetry festival they made fun of us guessing that nobody would have come and the brave who would, surely, would have been very bored. Today, after two editions, the third one is taking shape and even if there are a lot of difficulties we are strongly motivated thanks to the feedbacks we received. One of them was particularly significant: we were happy but tired at the end of the second day of “Andata e Ritorno 2.0” when two guys, drinking beers and with a strong venetian accent, came close and told us “We haven’t listened to a poem since we were six, at elementary school: we forgot how beautiful poetry could be!”.